This page is a starting point for the Linux4SAM offer and allows you to easily get a running embedded Linux distribution on SAM9x5 products. Each product: SAM9G15, SAM9G25, SAM9G35, SAM9X25 and SAM9X35 is supported at the same level with same components. On the software side, the nature of the chip and board is determined at runtime. This Getting started describes also how a Linux4SAM system boots and how binaries are installed on FLASH memories. For each topic a more detailed section exists with in-depth description, valuables web links, source code how to rebuild used binaries. Click on the image up above to select a topic. Several pieces of software are involved to boot a linux kernel on SAM9 products. First is the ROM code which is in charge to check if a valid application is present on supported media (FLASH, DATAFLASH, NANDFLASH, SDCARD). Boot Program - Check if a valid application is present in FLASH and if it is the case download it into internal SRAM. For more information on this topic, please check following diagram extracted from the product datasheet and the Boot capabilities matrix. 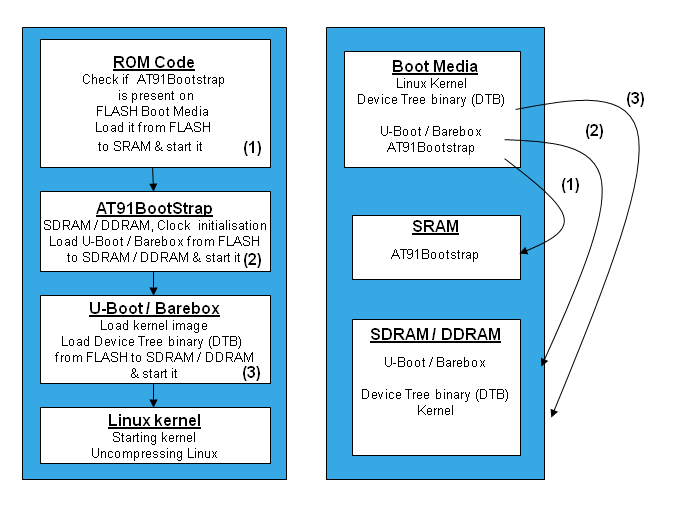 U-Boot - The bootloader, in charge of download kernel binaries from FLASH, network, USB key, etc. Start the kernel. Linux kernel - The operating system kernel. Root Filesystem - Contains applications which are executed on the target, using the OS kernel services. Processor comes out of reset and branches to the ROM startup code. The ROM startup code initializes the CPU and memory controller, performing only minimal initialization of on-chip devices, such as the console serial port to provide boot diagnostic messages. It also sets up the memory map for the kernel to use in a format that is consistent across platforms, and then jumps to the boot loader. The boot loader decompresses the kernel into RAM, and jumps to it. The kernel sets up the caches, initializes each of the hardware devices via the init function in each driver, mounts the root filesystem and execs the init process, which is the ultimate parent of all user mode processes, typically /sbin/initd. a .bat script able to run the flashing script calling SAM-BA itself. Ok, now you should have the Linux demo up'n running on your board ! Have a walk through applications of this demo. You can also access the Linux console through the serial line plugged on DBGU port. If you want to rebuild this demo from sources, go through each component topic and you will have a comprehensive explanation of it role and how to build it. 1 : *AT91SAM9X5-EK*: common board for every SAM9x5 chip in the family.